The steel frame for the new boathouse for the City of Cambridge Rowing Club is now being erected. 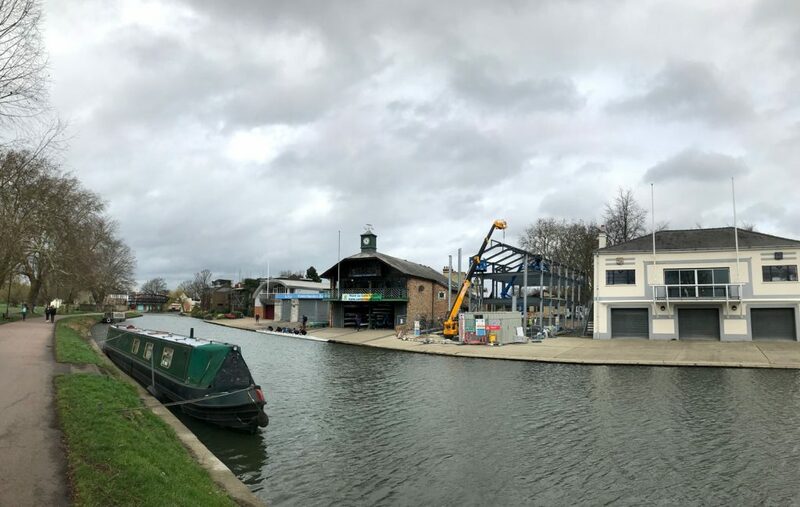 Located opposite Midsummer Common, Cambridge, the new boathouse will provide larger, modern facilities for the rowing club, which is one of the largest clubs in the region thanks to its active and engaged membership of around 300 rowers. The former boathouse was demolished after it was agreed by the Cambridge City Council that it was no longer deemed suitable for purpose, and that a new facility would not negatively impact the character of the conservation area in which it is located. Built in the 1950s, the previous facility was smaller than its neighbouring boathouses. Once complete, its replacement will be of a similar height to the surrounding buildings on the river, and its position will be brought forward to match. Follow our blog posts to find out more about the progress of this project. If you have a commercial building which requires renovation, extension or any another architectural alterations, please get in touch with our team of architects on 01284 760421 or visit our contact page here.